Summary: A man with no name is investigated for using the name of an organization to collect donations. 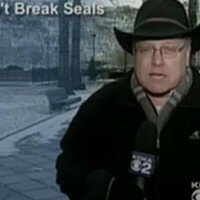 Station: WPXI Reporter: Rick Earle When it Aired: Nov. 20 Running Time: 2 minutes, 52 seconds Visuals: * Fans flocking to "Steel Man" -- clad in real steelworker gear embellished with, let's just call them "brave alterations" -- and posing for photos with him. * Pittsburghers plunking money in Steel Man's big, plastic jar. Highlights: * When Earle describes our postindustrial hero: "Dressed in a silver suit from head to toe, the man called 'Steel Man' makes his way through the crowd ..." * When Earle asks him his name, and he responds, "I am The Steel Man." Earle asks, "Well, tell me what you're doin'." The Steel Man replies, "Well, basically I'm collecting some money for juvenile-diabetes research, Team Andy." * When David Donahue, the executive director of the Juvenile Diabetes Research Foundation's Western Pennsylvania chapter, says, "We rely on people to raise money for us." And while the report notes that Team Andy is a legitimate fund-raising group, Donahue notes "[T]here's right ways to [fund-raise], and there's wrong ways to do it. I would have to say this probably borders on the wrong way." * When Donahue concedes that "We can't document anything from Team Andy" -- whose representative, Earle says, refused to speak about Steel Man. (Though by story's end, Earle confirms that Steel Man did contribute some $450 to the group, and that his charity drive ended with that donation.) * When Earle confronts Steel Man once more -- "Tell me your real name again," and he answers, "I don't give out my real name, sorry." What We Learned: Steely McBeam, look out! Unanswered Question: Who is THE STEEL MAN? News Value: 3. There are bigger fish to fry, but sometimes it pays to keep your eye on the small ones, too. Summary: An "Action News Extra" that concludes that a beauty product is nothing more than $40 of hype. Station: WTAE Channel 4 Reporter: Wendy Bell When it Aired: Nov. 19 Running Time: 3 minutes, 45 seconds Visuals: * Wendy Bell closing her eyes and scrunching her face as she squirts herself with the touted "miracle spray." * Evidence that the graphic department went into serious overdrive -- as giant words in assorted "crackled" fonts ("DEHYDRATED," "DULL," and "OLD") scroll across the screen. Highlights: * When Bell advises, "French [cosmetics] company Clarins says its 'super spritz' can shield your skin from ... damaging radiation from cell phones and computers, which Clarins says causes our skin to age faster than it should." * When goggle-wearing expert Todd Przybycien, head of Carnegie Mellon's Biomedical Engineering Department, says, "There's been several studies that have been done exposing skin cultures and skin tissue ... to the kind of electromagnetic radiation you get from a cell phone, and really, the studies don't conclude that anything happens. ... We don't see any evidence for that." * When Bell continues, "And while Expertise P3's ingredients may sound scientific, this 'super spray' is missing one pretty big thing: sunscreen -- something we do know protects our skin." What We Learned: That we should be more fearful of products like this than the pseudoscientific "dangers" they "protect" against. Unanswered Question: Should we file this one under mist-busters, Wendy? News Value: 5. It's soft news, but a hard reminder that if it sounds like bunk, it most often is.